The benefits of consuming active Manuka honey (or Jellybush honey) for healing and good health are known to many and the research is emerging to back it up. But you may be wondering How to take Manuka? How do I take Manuka honey? It is generally taken by the spoonful, used in drinks and applied directly to the skin. There are many recipes and ideas for using active Manuka honey, some of which you can view on our pinterest page. Taking a spoonful of undiluted Manuka honey allows it to be readily and quickly absorbed by the body. Usually, the dosage ranges from one to three teaspoons of raw Manuka honey per day. Your dose and method will vary depending on your reason for using medicinal honey. The benefits can be felt within a few days of consuming it daily, and many people increase their dose, from teaspoons, up to 3-4 tablespoons per day for 3 months and beyond. But please seek professional medical advice if you have an infection or suffer from a serious illness. Due to a low occurrence of infant botulism, raw honey is not recommended for infants under 12 months, although cooked honey would be OK.
Manuka honey has a nutrient dense profile and its natural sugars and carbohydrates are quickly and easily absorbed by the body. It is excellent for sports, fitness and training sessions, giving you a quick energy boost. If you are using Manuka for healing internal infections or aiding the digestion process, it’s recommended to consume it with food, which slows down absorption so the honey can work it’s magic on your stomach. You may take up to 4 spoons daily. It has been reported to sooth the gi tract, aid IBS symptoms, discourage bad bacteria and encourage the beneficial bacteria of your stomach. Including a spoonful of Manuka honey in your daily diet is a great way to combat the cold and flu season for the whole family. For colds and flu symptoms, take a spoonful before meals and once before bedtime. Current research is focusing on how active honey is even able to conquer antibiotic resistant bacteria. (Such as E.Coli – See study here) Many people also report relief from seasonal allergies by consuming raw Manuka honey daily. warm milk, yogurt or juice in place of sweeteners. For an irritated throat, you can use it together with lemon in warm water to soothe. See our pinterest page for ideas on smoothies and recipes that can aid healing. Active Manuka honey can be applied to areas with wounds, acne, eczema, psoriasis, and rosacea. It is usually applied after cleansing the infected area and then covered with a sterile dressing overnight, or you can change it every few hours. Applied this way, it is not messy For cuts and burns, wipe wound with a sterile cloth, removing any foreign objects and then apply honey directly to wound using a sterile cotton tip or cloth. Cover and repeat as needed, up to a few times per day. The honey will help draw any foreign objects to the surface, and aid in skin repair, whilst its antibacterial properties keep infection at bay. But please do seek professional medical advice for any serious wounds or wounds that aren’t getting better. You can lightly apply honey as you would a facial mask. Leave it for an hour and then wash with warm water and soap. The process is then repeated daily until results are evident. See our pinterest page for lots of recipe ideas on how to use Manuka honey for health benefits and beauty applications. Some of our customers have even applied Manuka honey to their horses and dogs for skin care of minor sores and wounds. For more info, check out the paper “Honey: its medicinal property and antibacterial activity”. We hope you have enjoyed our guide on How to take Manuka honey. Australian honey producers are set to tap into a potential billion-dollar global market for medicinal honey, with new research confirming powerful antimicrobial properties in the flowering nectar of trees found across Australia. The joint study by three Australian universities is testing up to 86 different species of Leptospermum, 10 times more than are found across the Tasman, where the trees are the basis of New Zealand’s burgeoning manuka honey industry. That country’s biggest honey producer, Comvita, is negotiating with Australia’s top producer, Capilano, to help it keep up with runaway demand for its products. Comvita chief technical officer Ralf Schlothauer said huge demand in Asia for manuka honey as a culinary product was making it hard for the company to satisfy its $100-million annual market for medical grade honey, bandages and dressings. “Right now the culinary price on very pure manuka honey is becoming so high it makes it very difficult to make a commercial decision to dedicate that honey to the medical use,” Dr Schlothauer said. Capilano general manager Ben McKee said even without the Comvita deal, growing demand for manuka honey, traditionally known as jelly bush in Australia, was helping raise the farm gate price for all honey producers. For a small number of bee keepers already producing manuka honey, the profits are spectacular. “Bee keepers don’t have to produce a lot of this honey to get a really good financial return,” Mr McKee said. “If they have access to this it can really turn their business from just running along to a really large business. The field research on Australian Leptospermum trees is being conducted by Simon Williams as part of a chemistry doctorate with the Sunshine Coast University. He said the trees were found in every state but their level of potential antimicrobial activity varied. “We’re sampling the source, the flower, to determine activity in the trees but it’s still going to come down to mother nature to determine whether or not there’ll be any nectar produced,” Mr Williams said. “While drugs can be very useful at times, honey is a really good topical agent that bacteria don’t become resistant to,” Professor Harry said. “Over many millions of years of bees making honey it’s the only food that can’t be spoiled, so nature has provided this solution for us that we stopped using because of antibiotics. The Australian study, jointly funded by government and industry, is also investigating a range of other medicinal properties in jelly bush honey. “Honey also has other properties, like healing properties and anti-inflammatory properties, so what we’re interested in is whether some of these honeys may do better at the anti-inflammatory and other honeys may be better at antibacterial, or perhaps there’s a few honeys that are best at all three of those activities,” Professor Harry said. Three Australian universities have teamed up to explore the eighty species of Manuka that could transform the local honey industry from just food to medical saviours. Primarily produced in New Zealand, Manuka is so effective at preventing infection it’s now in high demand in hospitals where antibiotic resistant bacteria like staphylococcus plays havoc with patient health. However, Australia could be on the threshold of joining this multi million dollar industry, based on a honey that for years was thrown out as unattractive to consumers. Not all Leptospermums are Equal. New Zealand Mānuka (Leptospermum scoparium) honeys regularly return $50/kg to the beekeeper. This reflects marketplace recognition for the wound healing and anti-bacterial activity of this honey. All honeys have an antibacterial action through; high sugar/hygroscopic nature, low pH and mild acidity, and hydrogen peroxide generation upon dilution. Mānuka honeys have an additional nonperoxide action through the presence of the dicarbonyl compound – methylglyoxal (MGO). MGO is not present in the nectar of the mānuka flower. Instead, the three carbon sugar, dihydroxyacetone, (DHA) which is present in the mānuka nectar, converts to MGO in the honey as it matures. Australia has 83 species of Leptospermum, including L. scoparium. A collaboration involving the University of Technology, Sydney, (UTS), University of Sydney (USyd) and University of the Sunshine Coast (USC), which is supported by Rural Industries Research & Development Corporation (RIRDC), Capilano Honey Limited and Comvita Limited, are jointly investigating new sources of active Australian Leptospermum honeys. Carter et al. (2010) first showed Australian honey had antibacterial activity, and that Leptospermum honeys had non-peroxide activity (NPA). Researchers at USC Honey Laboratory (Windsor etal. 2012) later showed DHA and MGO were present in Australian Leptospermum honeys. The current research aims to identify new regions and species for Leptospermum honey within Australia, and to also increase returns to producers through further research into the wound healing properties of these honeys. Individual beekeepers are invited to become involved in the research by donating representative honey samples, and to receive back their test results. The importance of this information to beekeepers is; targeting the right species for active premium honeys is important. Bees collect from available flowers within a 3 km radius. Single floral sources are impossible with overlapping flowerings, and multiple species present. However the most active species can be targeted, or for lower activity culinary honeys, mixed species are still fine. The conversion of DHA to MGO as the honey matures is complex. The reaction is dependent on acidity, amino acid content, temperature and time. Some producers mistakenly heat treat honeys to accelerate the process. This is detrimental to the honey’s value. Firstly, at lower temperatures the conversion is slower, but at a higher percentage conversion. At elevated temperatures, DHA is lost faster, but less ends up as MGO. Anecdotally, the conversion is two DHA to one MGO at 20 oC, but three DHA to one MGO at 30 oC. Further elevated temperatures produce the undesired hydroxymethylfurfural (HMF). A maximum level of 40ppm HMF has been set by the International Honey Commission for culinary honeys. Short heat treatments to blend, separate waxes or to decrystallise are fine. Extended heat treatment not only produces HMF, but also does not allow maximum MGO development. In the USC laboratory, storing Leptospermum honeys at 37 oC for 60 days produced on average an 88ppm HMF increase (Windsor etal. 2013). Tasmania has the other problem, where ambient temperatures are often too slow for commercial conversion. We recommend 20-25 oC for 6 months – 2 years for development of MGO. PIP COURTNEY, PRESENTER: Dairy may still be the darling of New Zealand agriculture, but there’s a growing buzz about gold – liquid gold. Producers of Manuka honey believe their product’s antibacterial properties could within years underpin an annual export business worth more than a billion dollars. But first, the industry needs to stop fake Manuka honey and it’s enlisted a Queensland scientist to help. If successful, there could be lucrative spin-offs for Australia. DOMINIQUE SCHWARTZ, REPORTER: The central North Island of New Zealand is dairy country. Here, the cow is king. But there’s another business on the block which is creating a global buzz – honey. DOMINIQUE SCHWARTZ: While all honeys have their fans, there’s one which has taken the world by storm. Not for its taste, but its medicinal qualities. MOIRA HADDRELL, MANUKA PRODUCER: Manuka is a unique honey to New Zealand. There is a little bit in Australia, but predominantly here in New Zealand, and its key component is that it has antibacterial qualities and it’s unique. There is no other honey in the world at this stage that seems to have those similar properties. DOMINIQUE SCHWARTZ: Moira Haddrell runs the export arm of the family honey business at Cambridge, a two-hour drive south of Auckland. She and husband Richard began 20 years ago with a handful of hives. They now have 3,000 of them – about 150 billion bees. They still produce various clover and multi-floral honeys, but the family’s sweetest business by far is Manuka, a honey they once couldn’t give away. MOIRA HADDRELL: When we started 20 years ago, it wasn’t regarded at all. In fact, people didn’t like it and we were cutting the comb out of the beehives and feeding it to the cows. We just couldn’t give it away, we couldn’t sell it. Nobody wanted it. Today, it’s the most sought-after product that we can produce. We honestly can’t produce enough Manuka honey for each year. We have people, they literally fly into Auckland airport, they hire or even buy a car and they drive to here in Cambridge and they pull up in the driveway and they want to buy every pot of honey that we have to take back to China or Hong Kong or wherever they come from. DOMINIQUE SCHWARTZ: One party was determined not to leave empty-handed. MOIRA HADDRELL: When I said thank you, but no thank you, because we didn’t have what they wanted or could supply, they actually came back 20 minutes later and offered to buy the entire company. DOMINIQUE SCHWARTZ: How much were they offering? DOMINIQUE SCHWARTZ: You weren’t tempted? MOIRA HADDRELL: For about two seconds. I have to confess, it was a big figure. DOMINIQUE SCHWARTZ: Bees make Manuka honey from the nectar of Leptospermum scoparium, the Manuka bush, which grows wild across New Zealand. Its unique active ingredient methylglyoxal fights bacterial infections. Hospitals use the most bioactive Manuka for wound dressings and a growing body of research points to manuka’s general health and beauty boosting properties. Novak Djokovic is just one of Manuka’s growing band of devotees. Others who swear by its benefits include film star Gwyneth Paltrow. GWYNETH PALTROW: When I first heard that I was gonna be on the cover of People’s Most Beautiful issue I honestly thought someone was playing a joke on me. DOMINIQUE SCHWARTZ: And Ozzy Osborne. Not the poster boy for good health, but hey, the hard-living rocker’s still alive. Once a humble bush honey, Manuka is now liquid gold. MARK HARVEY, MANUKA PRODUCER: The demand from people who’ve got money is insatiable. Mark Harvey is the general manager of Happy Valley. It bottles 15 times the amount of honey it did six years ago and exports to the US, Europe and Asia. MARK HARVEY: In 2008, when I got involved, we pretty much were a boutique company and the production was about 15 tonne of honey. Today, we’re packing around about 225 tonne of honey. DOMINIQUE SCHWARTZ: As well as producing honey themselves, they bottle for other suppliers. MARK HARVEY: Today, we’re bottling for another contract customer and this honey here is going to China. This order is 12 tonne of honey, so it will comprise of around about 12 pallets of New Zealand honey going to China. DOMINIQUE SCHWARTZ: The higher the antibacterial activity of the honey, the higher the price. This batch is worth about $20 a kilo. But honey with a unique Manuka factor rating of UMF 20. MARK HARVEY: By the time it’s packed, it’s probably around $150 a kilo export. DOMINIQUE SCHWARTZ: And as much as $300 a kilo in shops overseas. MARK HARVEY: I think eventually this jar of honey might become too expensive for the normal consumer and it’s gonna be graded as medical. DOMINIQUE SCHWARTZ: So the future for Manuka is not spreading it on your toast, it’s spreading it on your wound? MARK HARVEY: I think so, yeah. DOMINIQUE SCHWARTZ: Dr Peter Brooks from the University of the Sunshine Coast says the potential of Manuka honey is huge. DR PETER BROOKS, SUNSHINE COAST UNIVERSITY: We could imagine it becoming the last defence against some bacteria. So where you’ve got recalcitrant wounds, for example, with methicillin-resistant golden staph, what we could do is treat those wounds with honey and clear the infection, not using the antibiotics that the bacteria are becoming resistant to. DOMINIQUE SCHWARTZ: But not all honey sold as Manuka is the real deal. As with any gold rush, this one has attracted its fair share of cowboys and crooks. Fraud has flourished. DR PETER BROOKS: It’s massive overseas, in that there’s probably two or three times more Manuka honey being sold in the international market than is actually being produced here in New Zealand. So it’s a case of somebody taking a $5 honey and selling it again on for $50, saying that it’s a Manuka. What that’s doing, that’s destroying the reputation for the beekeepers that are producing the genuine article and also reducing their returns. DR TERRY BRAGGINS: Hello, Peter. How’s the run going? DR PETER BROOKS: Hello, Terry. Oh, it’s looking quite strong here. So we’re getting fairly strong leptospermum showing up. DR TERRY BRAGGINS: This one here? DR PETER BROOKS: Yep, that’s the one. DOMINIQUE SCHWARTZ: Dr Brooks is working with New Zealand scientist Dr Terry Braggins. They’ve been commissioned by concerned UMF producers to develop a chemical fingerprint for Manuka honey. DR PETER BROOKS: We’re looking for unique compounds in the honey that come out of the nectar, so we can trace it back to the floral source. So that when you hold another honey up to it, if there’s something mismatching from a different floral source, we can pick it out as not being true to type. DOMINIQUE SCHWARTZ: The aim is to develop a simple test which could be used by importers and sellers to confirm that honey IS true to label. DR PETER BROOKS: It’s a good Manuka, this one. DR TERRY BRAGGINS: Yes, it is. DOMINIQUE SCHWARTZ: Happy Valley is one of the producers bankrolling the scientific research. Marketing manager Narissa Harvey says customers in their factory shop can trust that they’re getting what they pay for. DOMINIQUE SCHWARTZ: But once the honey leaves their property, it could be a different story and a simple authenticity test would offer valuable protection against fraudsters. NARISSA HARVEY, MARKETING MANAGER, HAPPY VALLEY: That’s our livelihood and it’s a resource that has only a finite amount. So we definitely need to make sure that we protect what we’re selling and that other people can’t sort of continue to rip off Manuka honey. DOMINIQUE SCHWARTZ: So, do you love these guys? RICHARD HADDRELL, MANUKA PRODUCER: Yeah. They are good. This is the best part about beekeeping. All the politics and stuff, we don’t like. DOMINIQUE SCHWARTZ: Back in Cambridge, Richard Haddrell is checking on his young queens and lamenting the cutthroat nature of beekeeping today. RICHARD HADDRELL: The opportunists, they haven’t got a love for keeping bees and making honey. They’re just in it for the money. DOMINIQUE SCHWARTZ: He says the fierce competition for Manuka honey has fuelled fights over territory and hive placements. Theft and vandalism is rife. The Haddrells recently had 23 hives stolen. RICHARD HADDRELL: Yeah, there’s some crazy stuff. People kicking over people’s hives and poisoning other people’s hives, stealing hives. Um… fights going on over land. Then there’s the landowners fighting with landowners that are next-door neighbours. Yeah, it’s a bit crazy. DOMINIQUE SCHWARTZ: The insatiable demand for Manuka has also opened up new horizons. Most beekeepers get Manuka honey by placing their hives near Manuka trees in the wild. But here at Whakatane, on the east coast of the North Island, Maori investors are experimenting with a Manuka plantation. JEREMY GARDINER, MANUKA BIOACTIVES: I think generations of New Zealand farmers are probably turning over in their graves. I think generations of farmers have chopped, burnt, sprayed Manuka to get rid of it and now we’re talking about going and planting Manuka and not just planting Manuka, but planting intensively. So we’ve got 5,300 trees which were planted this year. They’re flowering, but we’ll collect honey next year. DOMINIQUE SCHWARTZ: Jeremy Gardiner is the managing director of Manuka Bioactives. The Maori-owned company aims to harvest not only Manuka honey, but also the oil from the leaves to use in anti-ageing and dermatological products. JEREMY GARDINER: So from an oil point of view, we can plant the trees in a way that we can harvest them easier than in the wild and from a honey point of view, we’re able to get more trees per hectare and create more flowers per tree and therefore produce more honey. DOMINIQUE SCHWARTZ: The early signs are promising. The plantation began two years ago with 27 different strains of Manuka. The company has already identified the best seven or eight producers. How’s the plantation working out? BEEKEEPER: Yeah, awesome. As you can see, the bees are loving it. There’s bees on pretty much every tree as we walk along the aisles and the flow’s really starting to come in now. Looks fantastic. DOMINIQUE SCHWARTZ: Can you see a difference working in a plantation situation? HONEY COLLECTOR: Yeah, it’s certainly a lot more intensified through here, so you know, the flow seems to be a lot better because of that. But you know, time will tell. DOMINIQUE SCHWARTZ: Manuka plantations may well be the way of the future. The Haddrells have just planted 18,000 trees on their block in Cambridge. Dr Brooks says honey producers in Australia should take note of developments across the ditch. DR PETER BROOKES: Manuka honey is a class of leptospermum honey. We have manuka in Tasmania as well and we have jelly bush in mainland Australia that’s showing the same activity. New Zealand’s got in early and they’ve got the science and the research. They’ve shown the activity and that’s where the recognition has come in for wound treatment and for market recognition. Australia hasn’t done that, so we’ve got to catch up by doing our own research to show that our leptospermum honeys are as active, not competing in the same marketplace, but being recognised for being Australian leptospermum honeys. MIKE HOWES, JELLYBUSH PRODUCER: Just gonna give the bees a bit of a smoke, pacify them and then open it up and I’ll show you some of the jelly bush honey. DOMINIQUE SCHWARTZ: The potential of jelly bush honey has already been recognised by a handful of Australian producers, among them Mike Howes. MIKE HOWES: Yeah. Smell that. That’s specifically a leptospermum smell. Australia’s Manuka. DOMINIQUE SCHWARTZ: The expat New Zealander has been in the jelly bush business for the past four years. MIKE HOWES: This honey’s all packed and sealed and in here is the jelly bush honey. DOMINIQUE SCHWARTZ: The liquid gold. MIKE HOWES: Liquid gold. That’s right. DOMINIQUE SCHWARTZ: This year he’ll harvest between 15 to 20 tonnes of honey and sell it for as much as $40 a kilo, eight times what a non-active honey might earn. (Tasting the honey) Mmm. It’s delicious. It’s very sweet, isn’t it? DOMINIQUE SCHWARTZ: Sweeter than Manuka. But still with that bitter sort of aftertaste. I think there’s a growing demand, because New Zealand can’t meet the world demand at the moment. We have a lot of inquiries into our jelly bush honey. DOMINIQUE SCHWARTZ: And you export already? MIKE HOWES: We’re exporting already, yes, into Japan, Saudi. DOMINIQUE SCHWARTZ: What about China? MIKE HOWES: China’s definitely a market. DOMINIQUE SCHWARTZ: With vast tracts of jelly bush in the coastal forests of northern New South Wales, the earning potential is huge. This is where the bees collect their nectar, about half a kilometre from the hives. In this section of track alone, there are four types of leptospermum, three of which have bioactive properties. So far, scientists have identified more than 80 different species of jelly bush, at least seven of them with antibacterial properties similar to Manuka. Mike Howes says developing a chemical fingerprint for leptospermum honeys will benefit Australia’s fledgling industry and the consumer. MIKE HOWES: Just because of the high amount of money that’s being paid for it, there’s always a chance that people might adulterate the product. So it’s a great thing that we can be certain that what you’re getting is the real thing. DOMINIQUE SCHWARTZ: And if it helps to prevent Australia’s version of New Zealand’s Manuka wars, even better. MIKE HOWES: The jelly bush wars. It could well happen. PIP COURTNEY: Dominique Schwartz there. PIP COURTNEY, PRESENTER: We recently did a story on the manuka honey industry in New Zealand and now it seems it’s Australia’s turn. Here it was once fed to cattle because of its bitter taste. But jellybush, or manuka honey, could be the saviour of Australia’s honey industry. After years of decline, the industry could have access to a billion-dollar market, with new research identifying the trees which produce manuka honey in every Australian state. Sean Murphy reports. SEAN MURPHY, REPORTER: In the Northern Rivers region of New South Wales, they’re searching for one of nature’s miracles. It’s a special tree with the nectar that helps produce manuka honey. WOMAN: This honey has literally saved lives. MAN: We don’t end up with resistant infections that are much harder to treat with antibiotics. SEAN MURPHY: Simon Williams has been travelling around Australia for the past year meeting beekeepers like Mike Howes, searching for leptospermum trees. They’re the source of manuka honey’s amazing healing and germ-fighting abilities and they’ve created a potential billion-dollar industry in New Zealand. 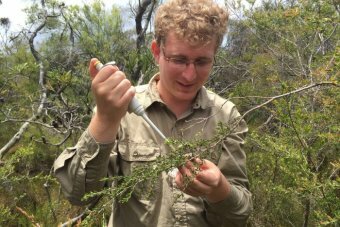 It’s a five-year study which is looking at leptospermum trees in every state. Australia has over 10 times more species of the tree than New Zealand. SIMON WILLIAMS, RESEARCH CHEMIST: We were trying to cover a lot of area, a lot of species. There’s 86 species. I would love to get to all of them. If I could identify every species and sample it, that would be great. It’d really help build up the knowledge of being able to say what’s good in what areas and what’s active and what isn’t active. It’s just a case of beekeepers identifying the right species in some areas. However, part of the problem with the producing in some of the states like South Australia and Victoria, they’re a little bit drier, so they don’t always have a good flowering year every year. SEAN MURPHY: Mike Howes has been collecting manuka honey for about 12 years. He was one of the first Australian beekeepers to focus on the honey traditionally known as jellybush and considered near-worthless. MIKE HOWES, BEEKEEPER: It’s true: like, a lot of beekeepers used to leave as soon as the jellybush flowered because it was too hard to get out of the combs. They didn’t realise its activity. It’s the same within New Zealand, the same thing happened. I think they used to feed it to the cows. It’s great. I mean, as far as beekeeping goes, it changes everything. We can get five times the value for this honey over normal honey and even more. SEAN MURPHY: As part of his Chemistry doctorate, Simon Williams is collecting nectar samples to confirm and measure the bioactive components that make manuka honey a powerful alternative to antibiotics. SIMON WILLIAMS: We’re sampling the source, the flower, to determine activity in the trees, but it’s still gonna come down to Mother Nature to determine whether or not there’ll be any nectar produced. SEAN MURPHY: There’s nothing new in claims about the healing powers of honey. The ancient Egyptians used it and before antibiotics, particularly in World War I, it was widely used. But now there’s some serious science backing the benefits. At Brisbane’s Princess Alexandra Hospital, they’ve done two separate studies on kidney patients confirming that medical-grade manuka honey prevents infection as well or better than antibiotics. DAVID MUDGE, PRINCESS ALEXANDRA HOSPITAL: Our concerns in patients in the hospital situation is that they’re prone to being colonised with – with germs like multiple-resistance staphylococcus aureus and other bacterial pathogens that are resistant to conventional antibiotic, so, the so-called multi-resistant organisms that are very common in the hospital environment. And it’s these kinds of germs that can be difficult to treat with conventional antibiotics, so if we can prevent the infection with them in the first place by using honey, then it’s better for the patients in the long term. SEAN MURPHY: Professor David Mudge says kidney patients are vulnerable to infection and applying honey to their dressings is now standard practice. DAVID MUDGE: It’s quite easy for germs that live on the skin to get through that opening and then into the bloodstream. So the honey around the end of the catheter serves as a barrier to stop the bugs getting into the bloodstream. SEAN MURPHY: The growing threat of drug-resistant superbugs has put a fresh focus on manuka honey. LIZ HARRY, MICROBIOLOGIST: While drugs can be very useful at times, honey is a really good topical agent that bacteria don’t become resistant to. So over millions of years of bees making honey, it’s the only food that actually can’t be spoiled. So nature has provided this solution for us that we stopped using because of antibiotics. Now that antibiotics are losing their power, we need to look at other solutions and I think honey is a fantastic one. SEAN MURPHY: Microbiologist Liz Harry heads a research project involving three universities funded by industry and government. They’re looking at the unique properties of Australia’s manuka honey. LIZ HARRY: So what we’d like to know is what particular leptospermum species, if any, are better or do they have different types of properties? What we might find, for example, is that one type of leptospermum might have a very high antibacterial activity. Honey has also other properties like healing properties and anti-inflammatory properties. So what we’re interested in is whether some of these honeys may do better at the anti-inflammatory and other honeys may be better at antibacterial or perhaps there’s a few honeys that are best at all three of those activities. SEAN MURPHY: New Zealand already has a well-established medi-honey industry. The nation’s biggest producer, Comvita, turns over about $100 million a year in medical-grade honey, bandages and dressings. The company says it can’t keep up with demand from hospitals and clinics, but is also dealing with a booming appetite for manuka honey as a culinary product, especially in Asia. RALF SCHLOTHAUER, COMVITA LTD: Right now, the culinary prices on very pure manuka honey has been coming so high that it becomes very difficult to make a commercial decision to dedicate that honey to the medical use. SEAN MURPHY: Comvita is negotiating with Australia’s biggest producer, Capilano, to manufacture manuka medical-grade products here in Australia. BEN MCKEE, CAPILANO LTD: As the growing demand for the medical side of it, that’s where it’s gonna end up. I mean, most of the honey should be heading that way. It’s probably the better use for an antibacterial honey and it’s probably the best value chain for that honey. SEAN MURPHY: The outlook may be bullish for Australia’s manuka honey, but otherwise, the honey bee industry is in decline. In New South Wales, which has nearly half of all Australia’s registered beekeepers, there’s been a 30 per cent decrease in the number of commercial hives in the last decade. Microbiologist Shona Blair has spent most of her career working with the honey bee industry, which she says is crucial for two-thirds of Australian agricultural output. SHONA BLAIR, MICROBIOLOGIST: If we don’t have bees, we lose a vast amount of the pollination services that are going on. SEAN MURPHY: But according to Shona Blair, the biggest issue for beekeepers around Australia is access to national parks and state forests. SHONA BLAIR: Beekeepers have businesses to run and if they can’t guarantee that they’re gonna get a honey crop every year, then they can’t run their businesses. So if they can’t get into the state forests or some sections of national parks, their businesses fall over. SEAN MURPHY: Neil Bingley is president of the NSW Apiarists Association. He says uncertainty about access to state forests and national parks is threatening the industry. NEIL BINGLEY, PRESIDENT, NSW APIARISTS ASSOCIATION: It’s all up in the air. Like, if we can’t renew our sites, we’ve got no prospects to continue, really. It’s mainly on public lands. That’s still a major component of our production and hive maintenance for pollination. SEAN MURPHY: This site near Batemans Bay on the South Coast of NSW is one of 14 maintained by the Bingley family for moving their 1,700 hives in search of flowering trees. But Neil Bingley says leases being offered by the NSW Government are too short and a trial auction system made many too expensive. NEIL BINGLEY: It’s – probably at least 50 per cent of your production can come from forestry, but not every year. Some years, there’s nothing with any buds to flower on the South Coast or any coast, so you may miss it for a couple of years. We had a period back 10 or 15 years ago we didn’t come down here for a five-year stint. But we maintain our sites. Forestry Corporation gets their fee, we maintain our sites, but it’s just not viable to be paying exorbitant fees to maintain the sites, and if we don’t, well, we’re out of business. SEAN MURPHY: Capilano says the industry needs greater access if it’s to capitalise on the potential of an Australian manuka industry. BEN MCKEE: This industry has found it frustrating forever and a day that we have to keep fighting for access to national parks and state forests. We’re in an area right now, it’s in a national park. There’s areas within this national park full of fantastic manuka that we could use as a medical product, but we don’t actually have access to it. So it’s quite ridiculous, really, and bees are so important to the environment, they’re so important to the food we eat and pollination and we should be giving beekeepers every bit of access they need to produce their products and keep their bees alive and healthy. SEAN MURPHY: Ben McKee says manuka honey is already helping raise the farmgate price for all Australian honey and he’s hoping it’ll attract new investment and a new generation of Australian beekeepers. BEN MCKEE: Our supply has been in decline and we’ve got a real opportunity to sell great Australian honey to the rest of the world and to our own consumers here by ensuring we’ve got a healthy industry to support the demand. Beekeepers don’t have to produce a lot of this honey to get a really good financial return. So, if they’ve got access to this, it can really turn their business from just running along to being a really large business. Like, some of the beekeepers, we’ve paid over a million dollars in one payment because of the amount of manuka honey, so it’s a real game changer for some beekeepers. SEAN MURPHY: Manuka honey is much stickier and harder to extract than most honey, but a bigger problem for the industry is fraud. By some estimates, two to three times more honey branded as New Zealand manuka is sold globally than is actually produced. RALF SCHLOTHAUER: Now we’re seeing some real counterfeit. We’re seeing some counterfeit in the marketplace of our brand, of our label. We’re also seeing people blending, we also saw for some time that people have been trying to manipulate the honey, make it darker by heating it and also putting inferior blends together to try to pass off as true. SEAN MURPHY: Australian and New Zealand scientists have been collaborating on a chemical fingerprint for manuka honey to guarantee integrity in the market. PETER BROOKS, SUNSHINE COAST UNIVERSITY: Well what we try and do is fingerprint the honey so we can identify which source they’ve come from for two reasons: so that we can say to the consumer, “This is a leptospermum honey of a different activity or different species,” and also protect so that the industry isn’t being flooded with imports of fake manuka honeys. SEAN MURPHY: Mike Howes says laboratory tests are especially crucial for informing consumers about different levels of bioactivity in manuka honey. MIKE HOWES: Yeah, I think it needs to be rigorous. I think the laboratories that are testing here in Australia have to have the science behind them and know exactly what they’re dealing with. SEAN MURPHY: A future honey boom in Australia may not be just about manuka. New research has also revealed that regular Australian bush honey may also have important health benefits. SHONA BLAIR: Most people now are aware of this thing of your good bugs and your bad bugs in your lower gut. And what we’ve found, that lots of Australian eucalypts will actually push the population in your gut towards more good bugs and less of the bad bugs, so it’s quite amazing that just a tablespoon of honey a day will have a really positive effect on your health because we’re now understanding that your gut bugs are so important for everything else that’s going on in your system. SEAN MURPHY: New Zealand now has an industry standard for manuka honey and its national honey association is seeking trademark certification of the manuka brand. The industry here is watching those developments closely, but Australia’s manuka honey may have some unique characteristics of its own to market to the world. BEN MCKEE: I think Australia, as we uncover the different types of species of manuka honey, I think we might find different characteristics with those different honeys, which will make the Australian side of the manuka story really quite interesting as well. With so many rating systems for Bio-Active honey now, figuring it all out can be a bit tricky, so I have compiled a short summary of the schemes in use and a brief description of each. Rather than re-invent the wheel, I will include links for you to follow and get detailed scientific explanations if you feel the need. We, at Medi-Jelly use the NPA (Non-Peroxide Activity) scale. This is an accurate scientific scale that ranks the activity of the honey due to MGO content, by comparing it’s bacteria-killing strength to that of standard Phenol solutions of varying concentrations. In this way, a 5+ NPA ratings means that the honey has the same effect on MRSA bacteria as a standard 5% Phenol solution. The same scale is used when ratings are allocated using the term UMF (Unique Manuka Factor, a trademarked and protected NZ term), ULF (Unique Leptospermum Factor, a similar scale developed in Australia). So essentially all these terms relate to the same scale, which compares honey to phenol solutions. Hence consumers can buy a product with NPA, UMF or ULF ratings of the same number and know that they have been tested and essentially are the same strength, in relation to the special effects that these leptospermum honeys all have that other honeys do not have. It has been shown that this special effect is directly related to the chemical MGO (Methylglyoxal) and so another rather direct chemical way to compare these honeys has also evolved, and that is by rating the MGO content of them in parts per million (PPM), or mg/kg. Whilst this may seem confusing, there are ways of comparing and converting between these two sets of scales as they are all essentially measuring the same thing, a copy of such a chart is included below, and a link to a converting website is also included. NPA stands for non-peroxide activity, the property that makes bio-active (UMF, ULF, NPA or MGO rating) manuka honey special. Manuka honeys carrying only a ‘total activity’ or ‘peroxide activity’ rating do not have this special property (Usually a blend). UMF ratings are based on NPA properties of honey. Honey with NPA ratings between 5 and 9.9 are labelled UMF 5+, honey with NPA ratings between 10.0 and 14.9 are rated UMF 10+, and so on.